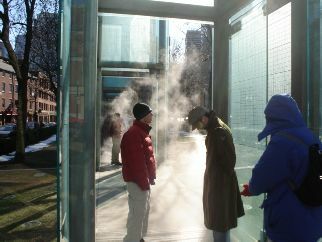 I was fortunate to be able to travel to Boston with my students last February. Working with Etgar 36, our Experiential Education Specialist (yes, we have one, and it’s a beautiful thing — he does a wonderful job), we devised a trip that was both meaningful educationally and religiously as well as a lot of fun. While I was in Boston with my students, I kept a paper journal. I have decided to reproduce excerpts from that journal here, along with a few pictures. Flying over New York was amazing. N- and I were looking for landmarks. I recognized the shape of Manhattan from all the maps I’ve studied. I could pick out several building and Central Park. J- found the Statue of Liberty. Conspicuously absent, of course, was the World Trade Center — we could see very clearly where it had been. As we flew over Long Island, I recognized Fitzgerald’s East Egg and West Egg (Manhasset Neck and Great Neck) — they looked just like the maps in the The Great Gatsby. N- told me all about how much fun New York is (I’ve never been). But he said New Orleans (where the 9th graders are going for their trip) is a must. The kids are all talking about food. Clam chowder is number one on their list. I did my civic duty as an educator of Jewish children and reminded them it wasn’t kosher. Beyond that, I can’t stop them. Before we took off, E- reminded me I was going to Boston with 21 16-year-old boys. Yikes! As we took off, N- said it was too late to turn back now. I’m already glad I came — just to share this with the students. Aerial view of Manhattan posted at Wired New York. We were asked to mention “something that tasted good.” M- said chocolate cheesecake. A- said cannoli. J- said chicken marsala. I loved the chocolate chip cheesecake at Mike’s Pastry. I don’t know where we had that pizza, but it was amazing (as was the company!) — ricotta cheese, peppers, and what else? I forgot. I tried my first real Israeli food — or at least I think it was Israeli — shwarma. I have to thank E- for recommending it. It was excellent. We ate dinner at kosher Rami’s in Jewish Brookline. Very small, but great food. Next we were asked to mention “something that caught your eye.” J- said a $3500 Panasonic massage chair. I said a section of the graveyard (Granary Burial Ground) where an entire family was buried — all had died young. S- said baked goods. What didn’t catch my eye? I was all eyes today. I wanted to soak in every sight. Or is it site? I looked at everything. Last, we were asked to mention “something that struck your ear.” M- said all the yelling, people in cars. L- said people noises, yelling, homeless begging. 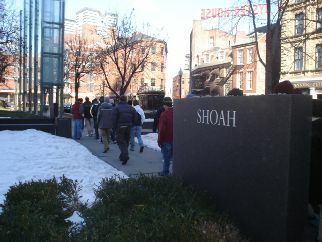 R- said the silence of the Holocaust Memorial. M- said the music of Blue Man Group. I had an incredible day. I am so glad I came. I feel closer to the kids. I really enjoyed the feeling of, well, I guess communion seems a funny word to use when speaking of Jewish kids, but it fits for me. I enjoyed joking, talking, taking pictures of everything they did. I had so much fun. The kids staged a memorable snowball fight at Bunker Hill. I think it will go down as the Second Battle of Bunker Hill. We followed J- to Cheesecake Heaven at Mike’s Pastry. I enjoyed Little Italy. All the Boston accents, the smell of Italian food. I walked everywhere today. I saw Paul Revere’s grave. And Ben Franklin’s parents’ graves, too. I took pictures of the kids in an ancient cemetery established in 1660, I believe (Granary Burial Ground). The Holocaust Memorial was incredible. To see the Shoah through the eyes of 31 Jewish kids… I took pictures of them standing in silence, reading, thinking. It cuts me to the core that if we lived in another time or place, they might have been numbered among the dead. 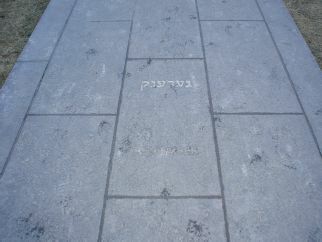 In the sidewalk, in Hebrew and English, the single word “Remember” was inscribed. My caption for the day was “Companionship.” Today I saw the Freedom Trail, Boston’s North End, Blue Man Group, and Brookline. Tomorrow I’m learning about Power to the People. “A child is not a vessel to be filled, but a lamp to be lit.” ~ Hebrew Proverb. As I write this I am sitting on Walden Pond, frozen over and covered with snow. About 150 years ago, Henry David Thoreau may have been standing in this spot, looking at the bare trees dressed in a layer of snow. Maybe he even made snow angels, like my students did. From where I sit, I hear the traffic of a nearby busy road. The moment of solitude and silence interrupted by progress, I guess. Still, this place is here. My kids are here, walking on the frozen water, and it seems to me no less a miracle than when Jesus is said to have done so 2000 years ago. I hear birds still here after many flew south — perhaps to our home in Georgia. I hear snow crunching under the feet of my students. Being here makes it so clear to me. Even though I hear and see the nearby road, it seems a place cut off — another world, frozen in time and unchanged though everything around it — the road, the buildings, the entire country, is changed. At this moment I feel like Emerson’s transparent eyeball. I finally, really understand what it is to know all, see all, and feel like I’m part or particle of God. Kim mentioned that there are a lot of things in Leviticus we no longer hold ourselves to, and it is interesting that this is chosen from among all those other things. She also mentioned the context in which this was occurring was related to abuse of boys in pagan religious ceremonies, and the early Jews were trying to stamp out worship of these false idols. Actually, interestingly enough, I was listening to the Judaics department having a discussion with our Pardes interns a few weeks ago, and there is a case for interpreting the Bible in such a way that the Judeo-Christian God as only one of many gods — however, He is a god that demanded monogamy — “Thou shalt have no other gods before me.” From what I was able to understand, there is a long rabbinic tradition connected to debating the meaning of this particular commandment. I mentioned a passage by Paul in the New Testament that many point to as well (1 Corinthians 6:9-10) that refers to to the “effeminate.” I admit I find that translation unclear. Some versions of the Bible use homosexual, but that isn’t the same as effeminate, so why was it translated that way? Whatever the case, Kim was right about one thing: Jesus never had one word to say about homosexuality. He spoke about adultery, for example, but never homosexuality. In all, I have to say it was very interesting to hear her speak. I think in this case power was ability to captivate an audience. 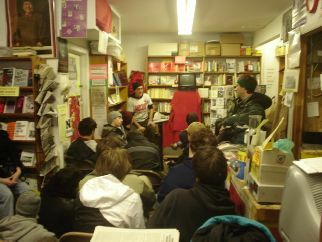 I personally wasn’t enthralled, but it seems like most everyone else was. These people perceive power as revolution and overthrowing current “regimes.” I felt they were a bit frightening and perhaps constructed their own truth to fit their beliefs. Also, I don’t get how not voting is revolutionary, and I’m glad the kids nailed them on that. If I heard the word “proletariat” one more time, I think I was going to scream. On the other hand, I think it was valuable for the kids to see and hear people with different ideas. How on earth anyone could idolize Mao or Lenin is beyond me. I was intrigued by Kim’s conviction. I think it puts her in a position of power. I was glad she mentioned Christ’s lack of expressed views on homosexuality. I really didn’t get him. I don’t know how a classroom would work under his guidance. I can’t connect either concept (power or truth) with what he said. I felt the power of God in the form of nature. I’m sure was of it was the symbolism of the place. But I did get Emerson’s transparent eyeball. I always felt God in nature, but I never felt as absorbed by nature as I did there. I am decidedly not a communist. All kidding aside, to me, power and truth were in my communion with the kids. I was myself and there was truth in that, but also power. I feel stronger bonds with them, and bonds are power. Harvard’s motto is “Veritas,” or Truth. I take that to mean they pass on a legacy of truth. What is my legacy, and what kind of power or truth will it have? We were much farther from New York this time, but I could still pick it out off in the distance. That’s amazing. I need to travel more. It’s hard with small children. I come from a family not real bent on traveling. When we went somewhere, it was to visit someone — not just for the sake of going there. I like going places, seeing them first hand. Touching history. It’s funny. I had my camera out ready to take pictures of the ground, but E- was right. The glare from the window renders the sites on the ground impossible to see. Yet I saw it with my eyes. My eyes can go, it would seem, where a camera cannot. 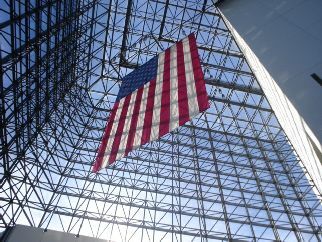 I went to Boston. I saw it with my own eyes. Not pictures from a book or film. I was there. 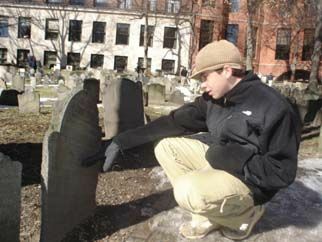 I touched a headstone carved for a two-year-old child who died in the 1600’s. 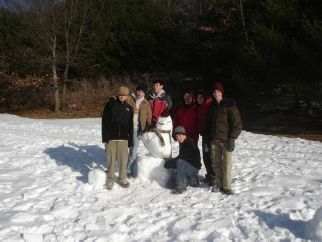 I watched my students wage a second Battle of Bunker Hill with snowballs. I sat in a pew in one of the oldest churches in America. I sat in complete and perfect silence on the frozen surface of Walden Pond. I became Emerson’s transparent eyeball and took in the city of Boston.